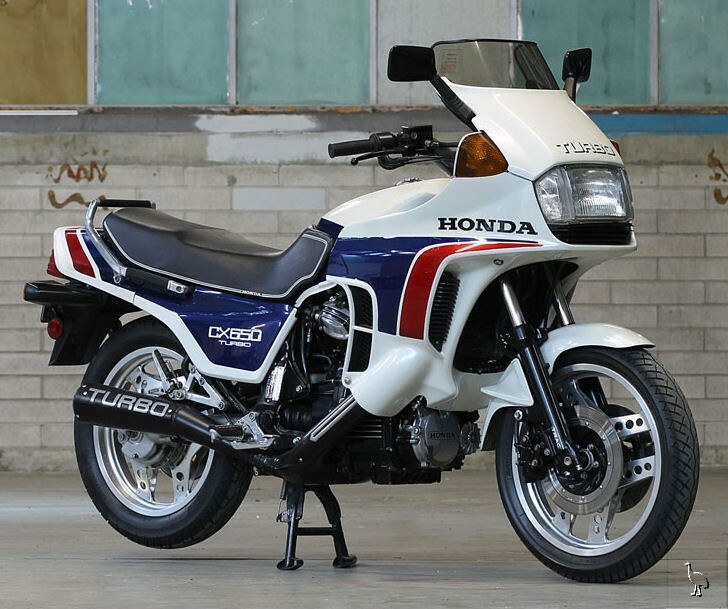 This bike, a statement of Honda’s engineering expertise and technical clout arrived in its day with great fanfare but was a poor seller: gone from the market within a year. Part of its problem was the fact that the turbo performed actually like a turbo-charge-bull. And that fairing that looks like overkill – well it’s not. At peak boost, the turbo provides approximately 19psi of over-pressure; this nearly doubles the power output of the engine when on full boost. The machine is capable of superb acceleration; however, the rider suffers somewhat from an abrupt and large step in power when transitioning from off-boost to on-boost. Essentially it was a scary bike for your average Honda rider. With this, it was quickly discontinued and followed by a succession of mundane and, at times, heinous offspring such as the CX500 ‘Custom’ that really did give the ‘Chopper’ a bad name. Today, the CX650 Turbo, capable of +225kph, is a rare and somewhat overlooked classic.